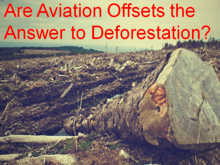 Is Aviation the Answer to Deforestation? Tropical deforestation has been a biodiversity and climate change concern for 40 years. Numerous efforts and several global initiatives to stem tropical deforestation have failed over that period. Now, the aviation sector’s need for emissions reductions — combined with forestry’s ability to deliver carbon offsets for the sector’s use — is being discussed as a way to save tropical forests.